We pause briefly at the start of this week’s coverage to remember those killed and injured in yesterday’s terror attack outside the Houses of Parliament in Westminster as well as pay tribute to the emergency services and passersby who responded to aid the wounded. • The UK’s first major exhibition dedicated to the evolution of the anti-war movement has opened at the Imperial War Museum this week. People Power: Fighting for Peace features such rare items as a hand-written poem by Siegfried Sassoon, artist Gerald Holtom’s original sketches for the iconic ‘peace symbol’, artworks depicting the destructive nature of World War I like Paul Nash’s Wire (1918) and CRW Nevinson’s Paths of Glory (1917), a handwritten letter by Winnie the Pooh author AA Milne outlining his struggle to reconcile pacifism with the rise of Hitler, and Peter Kennard and Cat Philip’s iconic photomontage Photo Op (2007) which depicts former PM Tony Blair taking a selfie against the backdrop of an explosion. More than 300 items are displayed in the exhibition including paintings, literature, posters, banners, badges and music, dating from World War I to the present. Admission charge applies. Runs until 28th August. For more, see www.iwm.org.uk/exhibitions/iwm-london/fighting-for-peace. 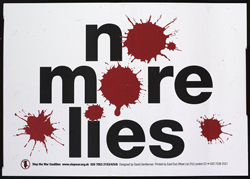 PICTURE: David Gentleman, Stop the War – No More Lies/© David Gentleman, reproduced with the kind permission of the Stop the War Coalition. • The first new gallery space to open at The National Gallery in 26 years was launched this week. Gallery B, designed by architects Purcell, features some 200 square metres of display space and features nine works by Rubens and 11 by Rembrandt. There are also drawings by contemporary painter Frank Auerbach, inspired by Rembrandt and Rubens works, in the Gallery B lobby and espresso bar. The launch also marks the daily opening of Gallery A which has hitherto only be opened on selected days. Entry is free. For more, see www.nationalgallery.org.uk. • A virtual reality experience which enables people to experience what it feels like to sit inside the Russian Soyuz TMA-19M spacecraft used by Tim Peake – the UK’s first European Space Agency astronaut – in a mission to and from the International Space Station opens at the Science Museum tomorrow. The South Kensington museum acquired the spacecraft in December last year and, from Friday, visitors will be able to take part in Space Descent VR with Tim Peake – a 360 degree state-of-the-art virtual reality experience which allows visitors to experience what it is like in the Soyuz’s 1.5 tonne descent module during its dangerous 400 kilometre high speed journey back to Earth during which it has to slow from a speed in orbit of 25,000 kph. The experience was created by Alchemy VR and made possible with the support of Samsung, Tim Peake and the ESA. For more information and tickets, see sciencemuseum.org.uk/VR. Perfect timing for me! I have just reviewed three books on Pacifism in WW1 and what happened to the conscientious objectors who faced military tribunals. Siegfried Sassoon, Paul Nash’s Wire and CRW Nevinson are very familiar, but the “People Power: Fighting for Peace” exhibition will pull it all together.